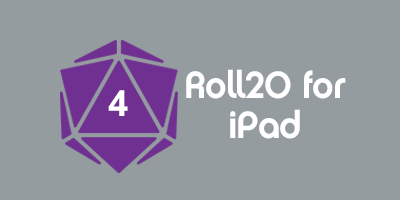 The Dice Roller GUI is a tool which makes it easy to perform dice rolls in Roll20 without needed to type in complicated formulas or roll commands. It's great for beginners who just want to start playing without learning about slash commands or macros. The Quick Roller activates when you hover over the just click on the t in the Tool Bar. Once active, roll the dice size and number (up to 5) can be rolled with a single click. More advanced rolling options can be toggled with the options along the top and bottom row, including GM rolls, Exploding Dice, Compounding Exploding Dice, and Penetrating Dice. 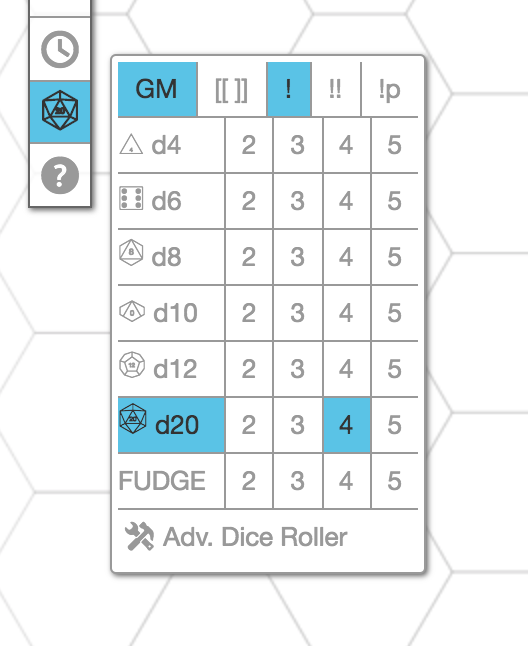 To open the Dice Roller GUI, just hover over the t d20 icon on the Toolbox, then click Adv. Dice Roller. The window will open on the tabletop, ready to use at any point. You can quickly perform a basic roll by just clicking on any of the d4 to d20 dice buttons along the top of the Dice Roller window. 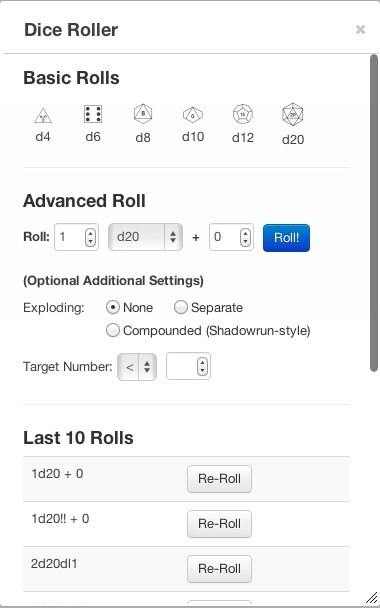 If you want to perform a more advanced roll (such as adding a modifier, exploding dice, etc. ), there's a section with more advanced options. Just choose the type of dice to roll, the number of dice to roll, any additional modifiers to add, and enable other features such as exploding dice as appropriate. Then click the blue "Roll" button to perform the roll. Finally, the Dice Roller GUI includes a list of your last ten rolls (including those performed in the text chat box), allowing you to quickly re-roll any of those previous rolls. The Dice Roller GUI does not contain every option available in the Roll20 dice engine, nor is it intended to. It's a way for players to get up and running quickly, but once you have the hang of how Roll20 works, you'll probably want to move on to using the roll commands. Consult the Dice Rolling Reference for more information. This page was last modified on 23 October 2018, at 22:32. This page has been accessed 42,966 times.